II. Is Coconut Oil Good For Hair Growth? Coconut is the source of oil, food, coconut milk, coconut water, and medicine. This natural product comes from Asian and South American, and now it is present everywhere in the world. 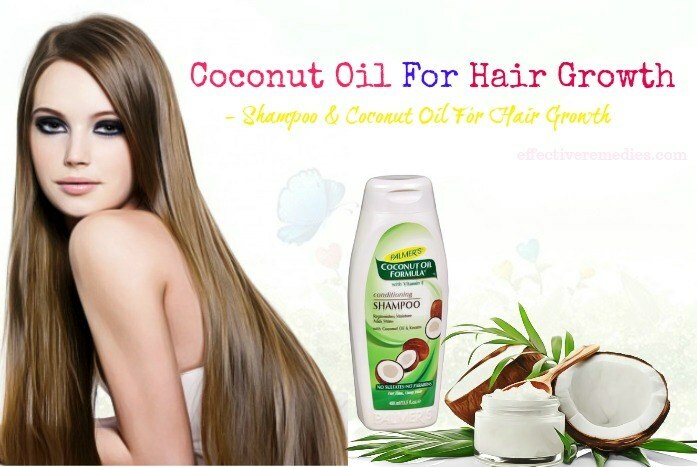 If you are looking for a perfect solution for natural hair growth, coconut oil is for you. It is considered as “superfood” because of the variety of benefits in improving health, making beauty or even motivating the growth of hair. In this article, Effective Remedies will show you the amazing benefits and uses of coconut oil for hair growth and thickness. We hope that the information will help you understand more about coconut oil and have the hair as you wish. As its name, this oil is extracted from coconuts. To convert them from solid to liquid, we need to have the temperature. Coconut oil is rich in saturated fats. It means that people should be cautious when using this oil because if you consume it in the large amount, it will increase LDL cholesterol that leads to heart disease. However, it also has lauric acid that plays an important part in increasing HDL cholesterol – a type of good cholesterol . Therefore, it is better to use the moderate amount of coconut oil. Apart from hair care, coconut oil is also known as a helpful solution to losing belly fat, making beauty and improving health. Many South Asians consider it as a main ingredient in their diet. 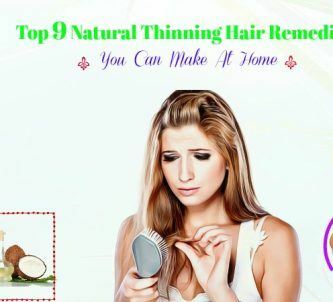 All internal and external agents such as pollution, sun damage, issues inside the body cause negative impacts on hair growth, make your hair become weak or even lead to hair loss. When we have to deal with these issues, we often look for brands advertised on social media. However, these products contain many chemicals that may make your hair condition worse, and they are quite expensive. In fact, there is nothing that can replace natural products and coconut oil is one of the best natural gifts in nourishing the hair. 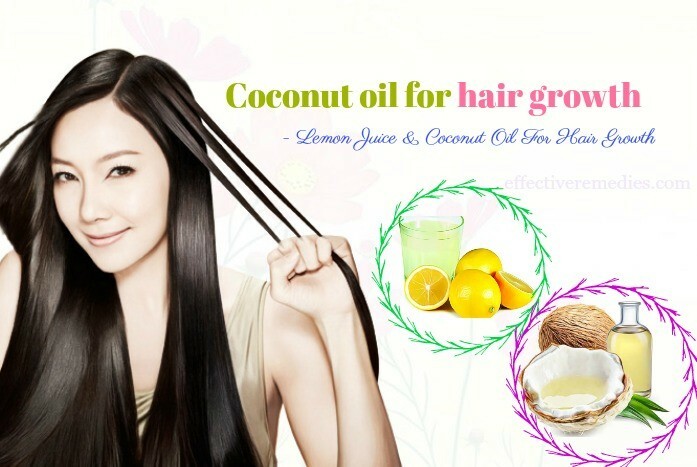 Coconut oil is the plentiful source of nutrients that are good for not only the body but also the scalp . 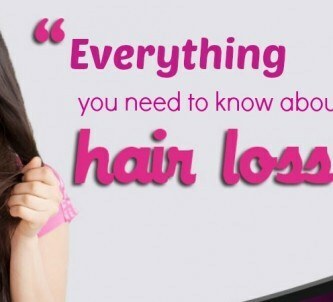 It has minerals, fats, iron, and potassium, helping make the hair strong and healthy. Besides, it is also a good way to preventing itching from the scalp due to antioxidants and antifungal elements. You can also replace lemon juice with olive oil, almond oil or castor oil if you feel your hair irritated because of acids in lemon. Apart from being a delicious and nutritious fruit, avocado is also the terrific treatment for skin and hair. The avocado is rich in vitamins A, E, and B-5, biotin, minerals, antioxidants, and crucial fatty acids that your hair requires for the growth. At the same time, treating the hair with avocado helps to moisturize, repair, and strengthen your hair, and minerals in this fruit were proved to be the effective substances in preventing the hair from breaking. The benefits of coconut oil and honey can make incredible differences in keeping the hair strong and healthy. Similar to coconut oil, honey is the rich source of antioxidant properties that restrain the hair from the damage and keep your hair healthy. Besides, it is an excellent emollient. That provides moisture for your hair and decreases the breakage – one of the reasons lead to the slow growth of hair. One dominant characteristic of honey is that it has antiseptic and antibacterial properties. These substances can eliminate scalp infection and other conditions like eczema, psoriasis and dandruff. Apart from these benefits, honey also cleans and strengthens your hair follicles, simultaneously stimulates the hair to grow from inactive follicles. Indian gooseberry or Amla is the sacred tree in Indian because of the variety of benefits in curing diseases. It has the high content of vitamin C, minerals and vitamins like iron, phosphorus, calcium, and carotene. Along with this, Amla is also a strong antioxidant substance. Regarding nourishing the hair, both coconut oil and Indian gooseberry have the same benefits such as providing essential nutrients to the hair, preventing hair from falling and becoming grey, removing dandruff, and treating scalp infections. 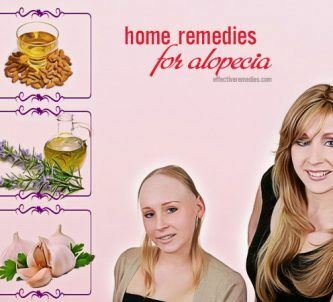 Therefore, this combination of two natural products will bring amazing results for the growth of hair. Along with using natural products, you can also mix coconut oil with your favorite shampoo to stimulate the hair, scalp, and the follicles and reduce hair loss. This way is very simple. Not just with shampoo, the combination of coconut oil and conditioner brings the substantial benefits of making your hair shinier and softer. If you do not have much time to take care of your hair or do not have enough necessary ingredients, only using coconut oil also makes substantial impacts on hair growth and thickness. You cannot need the conditioner anymore because coconut oil has the same benefits. In the process of using coconut oil for hair growth and thickness, you should avoid overdoing it. Virgin coconut oil is a quite heavy substance, and just the small amount of it can bring good results. Even the lighter oils make your hair look greasy if you consume too much. However, you always can add more if your hair is damaged heavily, but in the limited amount. If you wash your hair every day, the oily accumulation is not an issue. On the contrary, you only shampoo a few days a week; you may feel stress in eliminating excess oil. 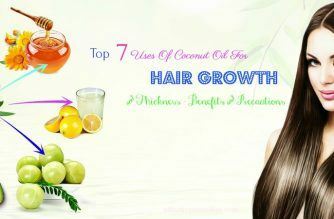 Above is the list of benefits and most popular uses of coconut oil for hair growth and thickness. Coconut oil is the type of oil containing many nutrients. Therefore, it has many different benefits in improving health and making beauty. Nevertheless, it also has side effects if we overuse it. By posting this article, we hope that you will find useful information in taking care of your hair, especially using coconut oil. 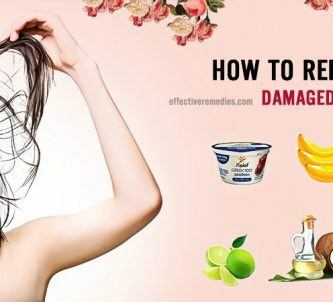 If you want to learn more about the natural remedies for other hair health conditions, please visit our DIY Recipes page and do not forget to leave your comments in the form below to show us your thoughts.